WASHINGTON (AP) -- Attorney General Jeff Sessions was pushed out Wednesday as the country's chief law enforcement officer after enduring more than a year of blistering and personal attacks from President Donald Trump over his recusal from the Russia investigation. Trump announced in a tweet that he was naming Sessions' chief of staff, Matthew Whitaker, a former U.S. attorney from Iowa, as acting attorney general. Whitaker has criticized special counsel Robert Mueller's investigation into potential coordination between the president's Republican campaign and Russia. Sessions, in a one-page letter to Trump, said he was resigning "at your request." The resignation was the culmination of a toxic relationship that frayed just weeks into Sessions' tumultuous tenure, when he stepped aside from the Mueller investigation. Trump blamed the decision to recuse for the appointment of Mueller, who took over the Russia investigation and began examining whether Trump's hectoring of Sessions was part of a broader effort to stymie the probe. White House chief of staff John Kelly called Sessions before the president's news conference on Wednesday and asked for his resignation. Sessions' undated resignation letter was then sent to the White House. Asked whether Whitaker would assume control over Mueller's investigation, Justice Department spokeswoman Sarah Flores said Whitaker would be "in charge of all matters under the purview of the Department of Justice." The Justice Department did not announce a departure for Deputy Attorney General Rod Rosenstein, who appointed Mueller and has closely overseen his work. Whitaker once opined about a scenario in which Trump could fire Sessions and then appoint an acting attorney general who could stifle the funding of Mueller's probe. In that scenario, Mueller's budget could be reduced "so low that his investigation grinds to almost a halt," Whitaker said during a July 2017 interview with CNN. Democrats, including House Democratic leader Nancy Pelosi and Senate Democratic leader Chuck Schumer, immediately called for Whitaker to recuse himself from the investigation, citing his public comments. Rep. Jerry Nadler, the top Democrat on the House Judiciary Committee, said he wants "answers immediately" and tweeted that "we will hold people accountable." Trump's relentless attacks on Sessions came even though the Alabama Republican was the first U.S. senator to endorse Trump and despite the fact that his crime-fighting agenda and priorities - particularly his hawkish immigration enforcement policies - largely mirrored the president's. 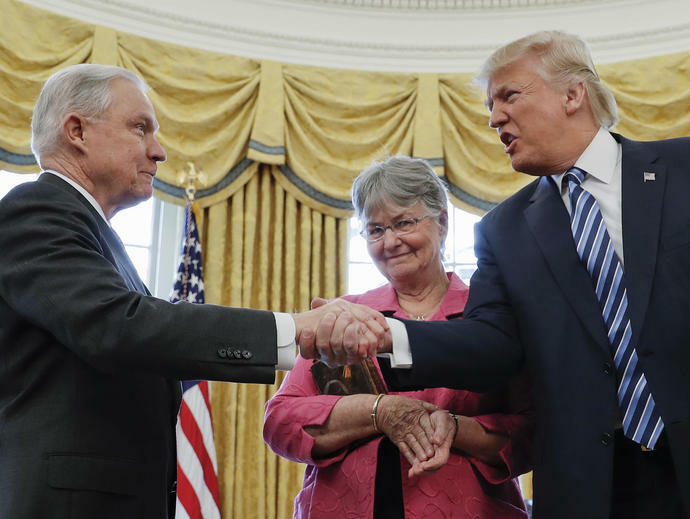 The rift lingered, and Sessions, despite praising the president's agenda and hewing to his priorities, never managed to return to Trump's good graces. The deteriorating relationship became a soap opera stalemate for the administration. Trump belittled Sessions but, perhaps following the advice of aides, didn't fire him. Sessions, for his part, proved determined to remain in the position until dismissed. A logjam broke when Republican senators who had backed Sessions signaled a willingness to consider a new attorney general. In attacks delivered on Twitter, in person and in interviews, Trump called Sessions weak and beleaguered, complained that he wasn't more aggressively pursuing allegations of corruption against Democratic rival Hillary Clinton and called it "disgraceful" that Sessions wasn't more serious in scrutinizing the origins of the Russia investigation for possible law enforcement bias - even though the attorney general did ask the Justice Department's inspector general to examine those claims. The broadsides escalated in recent months, with Trump telling an interviewer that Sessions "never had control" of the Justice Department and accusing him on Twitter of not protecting Republican interests by allowing two GOP congressmen to be indicted before the election. Associated Press writers Jonathan Lemire and Mary Clare Jalonick in Washington and Ryan Foley in Iowa City, Iowa contributed to this report.